This is a Kurtis road car. But not just any Kurtis road car. This is Frank Kurtis’ Kurtis road car. Frank Kurtis built some of Indianapolis’ best race cars in the 1940s and 1950s and he also built some great sports cars. 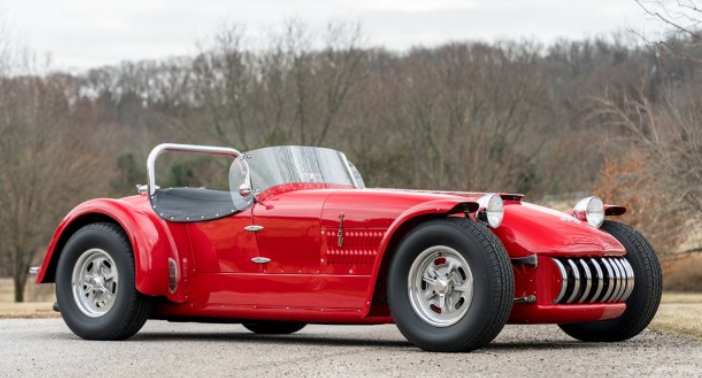 The 500S was based on his Indy Roadsters and kind of resembles an Allard J2X – which had a similar purpose. This car is powered by a 5.7-liter Chevrolet V-8 making an estimated 400 horsepower. The body is aluminium. This chassis was sold to Frank Kurtis (and his son, Arlen) in the early 1980s as a disassembled car for the father and son team to restore. The running gear they used was new (thus the huge horsepower rating from the Chevy crate motor) but it was an original 500S chassis. The Kurtis family sold the car in 2003 and the current owner bought it in 2014. Only about 26 500S road cars were built and this one has a pretty good story. It should bring between $125,000-$175,000. Click here for more info and here for more from this sale. This entry was posted in Uncategorized and tagged 1954, 500s, auctions, cars, classic cars, gooding & company, kurtis, sports cars by classiccarweekly. Bookmark the permalink.